As you may already know, foreign travelers are required to have a Visa before entering Myanmar. Meaning that unless you’re from one of neighboring ASEAN nations, there’s no Visa on arrival for you. As the Myanmar visa application takes some time, paperwork, and organizing beforehand, we’ve gathered all the relevant (and updated) information so that your trip can get off on the right foot. You can apply for a Regular e-Visa or for an Express Tourist e-Visa at evisa.gov.mm. With the Express e-Visa, you can have the application process completed in 24 hours. But considering the number of complaints and that it is a recent service, we recommend doing it at least 3 days in advance. Just in case. • A recent digital personal photo (48mmx38mm). You can pay with MasterCard, American Express, Visa, or JCB. Have in mind that not all passport holders are eligible for applying to an e-Visa. You must be from one of the 100 countries that have an agreement with Myanmar. Know more here: evisa.mm/NoticetoTourists (jump over to paragraph 10 and 11). After applying, you’ll be sent the e-Visa approval letter to your email inbox. The letter is valid for 90 days from the issued date, and if it expires, your entry into the country will be denied. By the time you cross the border, you must carry a printed version of the letter to present to the border officials and get your passport stamped. After entering Myanmar you’ll have 29 days to visit the country, and you won’t be able to leave and re-enter without acquiring a new Visa. Nevertheless, your stay can be extended for another 14 days, paying 3 USD per day fee to the immigration officers at the border (plus an extra fee of 5 USD if you’re leaving through an airport). There’s a slight problem with overstaying though. Some hotels may deny service to overstayers (as they would be in for a hefty fine should they be caught for allowing that). Each of the embassies on the list has their own hours to handle Visas. Also, application processes can take from 1 day all the way up to 2 weeks. • 2 personal photos (35mmx45mm). The photos should be recent. Cost can vary according to the embassy you’re applying — to be paid in cash only. We made our application at the Myanmar consulate in Chiang Mai and paid 1600 THB (49 USD) to have the visas ready in 3 business days. If you wish to have it processed on the same day, you’ll have to pay 2400 THB (74 USD). Working hours are a bit odd there: 9:30 AM to 11:30 AM. * The application form asked us to write down the address of the hotel we would be staying in Myanmar. Not having a reservation yet, we wrote down the city and a hotel name that we managed to memorize from a Google search days before. We were not asked for another evidence. Is a pre-booked outbound flight necessary to enter Myanmar? 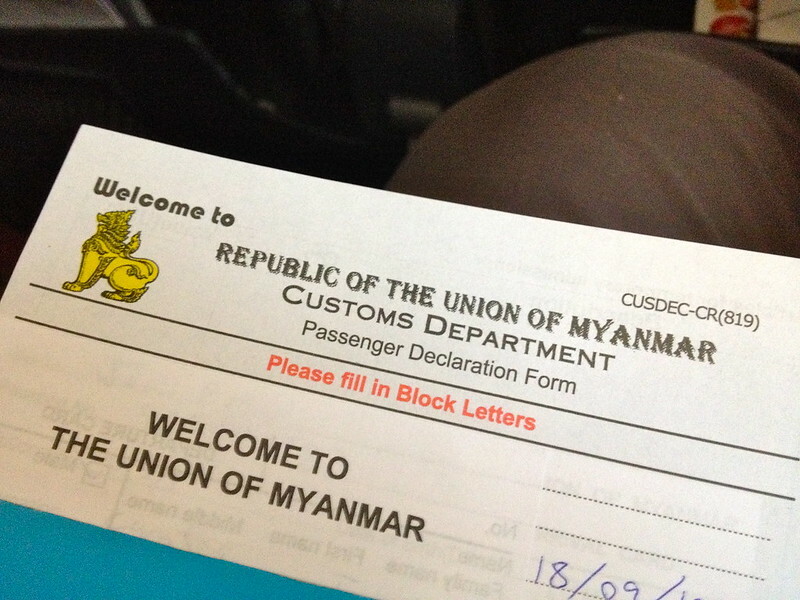 Some travel books allege that to enter Myanmar foreigners must have a proof of a pre-booked flight leaving the country. On the other hand, many bloggers say they don’t. The truth is that neither at the moment of our visa application nor at the moment of crossing the border we were asked for that. Apparently, the myth exists due to border regulations providing that possibility — even though it rarely happens. So in the spirit of reducing the likelihood of that happening check out the article: 9 tips and tricks for a smooth border crossing. The vaccine is mandatory if you’re arriving from a country with risk of yellow fever. Check the updated list to see if you’re required to get it: countries with risk of Yellow Fever. If you have any questions regarding Myanmar visas, use the comments below. We might be able to answer. Cover photo by James Antrobus.